Year of the Labbit: There's a Mau5 in the Cupboards! For days now, Pipkin has been hearing scratching and shuffling noises in the cupboards when he's been cooking. 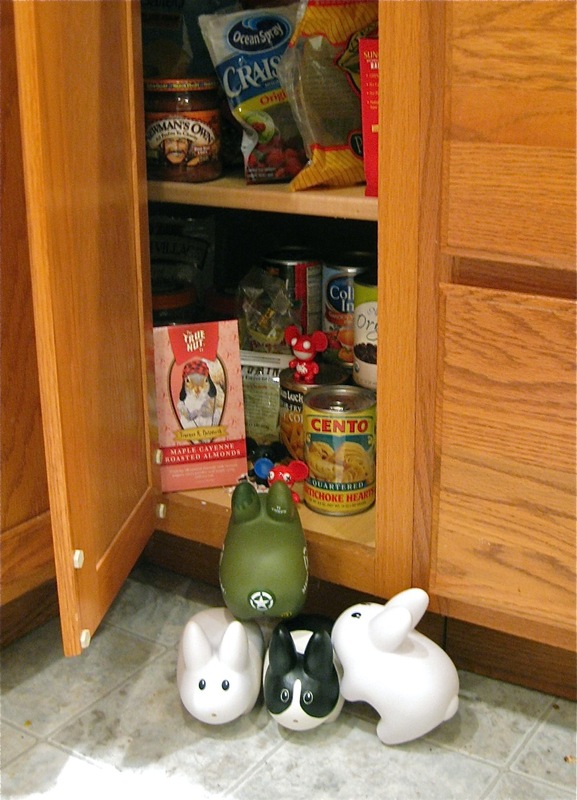 Captain Holly went searching for the source and it turns out...a rather naughty mau5 has been raiding the pantry and eating the labbits' grains and nuts! 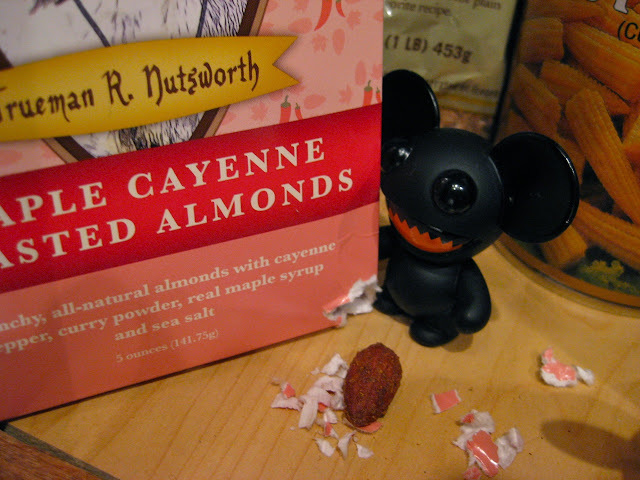 Just look at the damage this mau5 has done to Pipkin's box of his friend Trueman R. Nutsworth's Maple Cayenne Roasted Almonds. Clover pointed out that at least he's got good taste and likes locally produced goods. 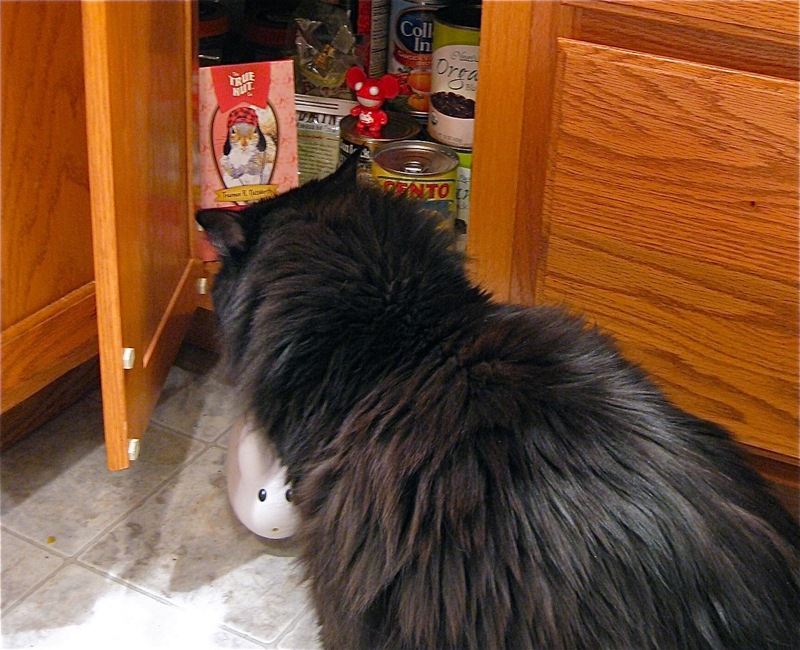 It's a good thing the cat is so well fed. She didn't seem to care about the mice. Oh yes, mice. It wasn't just one mau5 in the cupboards, but three. The mau5 with the teeth just happened to make a lot more noise chewing through the packages. NeeChee checked out the action in the kitchen but doesn't much care for having to kill her food herself. Pipkin didn't want the mau5e5 - er - mice, to have to steal any more food, so he sent Captain Holly in to greet them and invite them to join the warren. There will be plenty of food to go around. 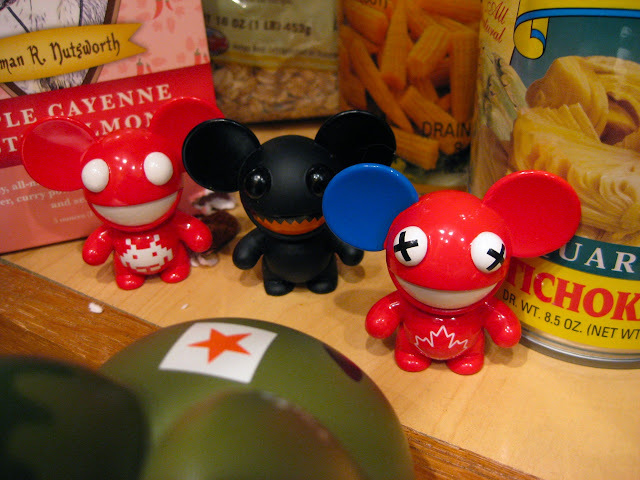 Well, Joel seemed to like the idea, so the labbits now have three new mau5 friends: Joel, the blue and red eared patriotic mau5; Tomohiro, the red video game loving mau5; and Zim, the saw toothed black fierce mau5. If you'd like to adopt a mau5 for yourself, you can find them at the Deadmau5 store in the US or the Deadmau5 shop at Kill the 8 in Canada. While you're there, pick up the new Deadmau5 album 4x4=12. It's what the mice and labbits dance to at 2 in the morning, and it'll get you moving, too! The First Blooms of Spring! No Beech, No Creek, No Bananas, No Sense.